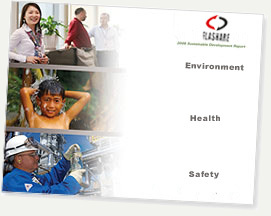 Flashare' commitment to sustainable development stems from our fundamental intent to thrive as an enterprise and to contribute to a better world long into the future. Striving for sustainability is a continuous effort, of which we are just at the beginning. We have defined for ourselves a clear goal: to conduct our business in a way that promotes economic growth, a healthy environment and vibrant communities, now and in the future. Flashare recognizes that our sustainability as a company is determined by the choices we make in growing our business in meeting the very needs of our stakeholders.